On v18.5, and when using both the default skin and Xonfluence I'm having an issue when moving the Kodi Fullscreen Windowed application using AutoHotKey. 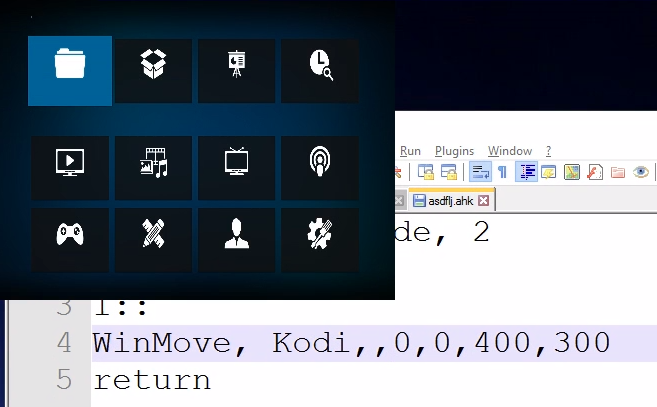 Using the below code attached to a hotkey to move the Kodi Application, the window and icons move and re-size properly but the text (and any video playing) doesn't seem to move. In straight Windowed it works fine, but I prefer to operate in FullScreen Windowed. So, what is v18.5 ?? Perhaps a full debug log (wiki) will shed some light on it, and on the (ancient?) hardware you are possibly using. Older video drivers may be a cause as well. Not sure if you're able to see when I move the window in the log, but hopefully it helps! I'm on an Intel Compute Stick with Core-M3. For what it's worth, using Kodi v16 the video/text re-sizes perfectly along with the window. I've been holding off on upgrading because of this bug, but would obviously much rather be on v18. After resizing you need to refresh the skin. Too bad there are various entries of banned repositories/add-ons in your log file. As per forum rules (wiki), we have a zero-tolerance stance of video piracy, and thus zero support for cases such as yours. You can either FULLY clean up your Kodi setup, or find yourself support outside this forum. Apologies. I've removed all offending plugins, and attempted to run XBMC.ReloadSkin() after each Window Resizing, but the video and text still doesn't seem to be resizing properly. Almost seems like Kodi doesn't know the window has been re-sized, so it keeps the video and text in the same place.. This happens on every skin, so I can of course provide another image/debug log with the default skin if that is better. Thanks for your help!